A helpless feeling washed over 11-year-old Lauren Gehl when she learned of the devastation left by hurricanes Harvey and Irma earlier this year. 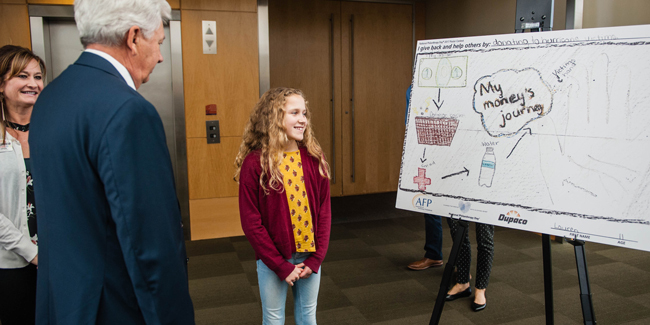 Those victims were the inspiration behind the young Dupaco member’s entry in the National Philanthropy Day® Poster Contest. Gehl—one of three winners to be recognized today during the National Philanthropy Day luncheon—illustrated that she gives back and helps others by donating to hurricane victims. “Everybody deserves to have their basic needs met, and I feel like it’s not fair if other people have less than others, so I like to give back,” she says. She enjoys participating in both school and community events that give of her time, talents and treasures, including canned food drives, serving meals to others and participating in bake sales. Gehl believes it’s important for kids to “do everything they can” to help others. “Simple things will go a long way,” she says.